The School of International Professional Development utilizes an advanced curriculum that combines English with social sciences, and is designed to allow students to become international leaders of the future. Aiming to nurture leaders in the global community. Allowing students to transition from simply learning English to becoming capable of learning in English. 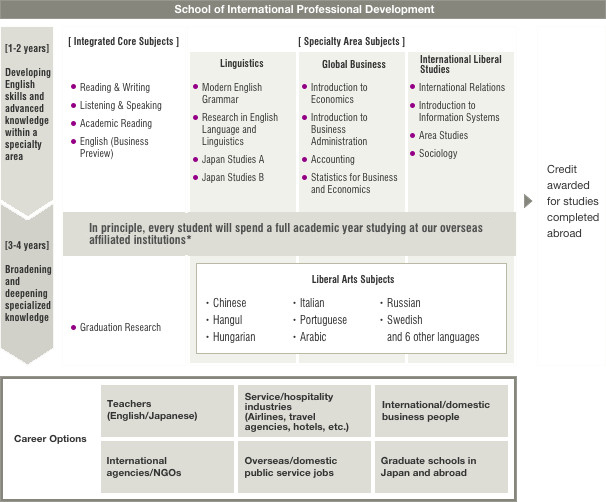 The school offers a unique English Intensive Program (EIP) for all students. Participation in the program allows students to immerse themselves in an English speaking environment, and provides the opportunity to earn more than 60 percent of their total credits in an all-English environment, including credits earned while studying abroad. In order ensure that students also develop a strong and accurate understanding of subjects and fields, social science classes are conducted in Japanese. By graduation, students are expected to reach English levels equivalent to at least 600 points on the TOEFL exam (100 points on the iBT) and 870 points on the TOEIC exam. Students study English and social sciences (including but not limited to topics such as international relations and international business) together, and build foundations for their future careers while adapting to changing international environments and learning about other countries and cultures. Learning to communicate and negotiate with individuals from different cultures who speak different languages, as well as developing leadership skills, will provide students with a great advantage over their competitors when they enter the workforce and take their first step into the careers that they have chosen. In principle, all students will study abroad for one year and deepen their understanding of fields that they are interested in. Kansai Gaidai University is affiliated with 387 universities in 55 countries, and provides students with environments in which they can learn and gain experience in various parts of the world with individuals from different cultures and backgrounds. *To take part in the Study Abroad programs, students must achieve a certain level of academic results in qualifying examinations. In order to ensure that students develop the knowledge and skills necessary for them to positively contribute to the world, the School of International Professional Development has designed three specialized fields in which students will study. It is also possible for students to study in classes that belong to fields other than the one they have chosen. The field of Professional English takes an academic and theoretical approach in studying the English language. By understanding how the English language is constructed and used, students become capable of using English as a tool for communication in a wide range of situations, such as in business and also English education, which is covered in this field. In this field, students learn fundamentals and theories that will allow them to understand and work in businesses around the world. The goal of the field of Global Business is to teach students the significance of various forms of capital and resources, how to manage such resources, as well as how to work in different types of businesses in varying environments and situations. By studying in this field, students are expected to become capable of understanding, analyzing, and working in business. Globalization and the development of borderless societies are encouraging the movement of human capital, knowledge, and various materials to different parts of the world. As different languages and cultures are being brought together, it has become crucial that individuals learn to be able to communicate and cooperate effectively with those who speak different languages and are from different backgrounds. Therefore, the field of International General and Liberal Arts aims to guide students in developing different perspectives and become capable of working effectively with whomever they meet, wherever they happen to be in the world. The school provides the English Intensive Program (EIP) that is designed to thoroughly train and improve the students’ grasp of English. As a part of the EIP, classes that cover the elements of reading, writing, listening, and speaking taught by native English speaking instructors are offered, and the classes are – of course – conducted entirely in English. Classes taught by Japanese instructors are available as well, and are also all-English. Language Development, a mandatory class for students in this department, features a content-based approach and looks at various field specific materials that are relevant to international relations and social sciences. By learning about the materials in English, students are able to not only improve their knowledge in different fields, but also strengthen their grasp of English as well. The EIP allows students to develop strong English skills in their first two years of university, which allows them to make the most of their time learning and training in different countries when they study abroad. The School of International Professional Development allows students to select and study in the field of Professional English, Global Business, or International General and Liberal Arts, and does not limit students to only course-specific or field-specific classes. Each field allows students to develop an understanding of English language studies and social sciences (including but not limited to international relations and international business), strong English communication skills, and also the ability to positively contribute to the world. During first and second year, students will acquire skills and knowledge specific to the field that they are interested. In third year, students will study abroad to further their understanding and also gain experience in their field. 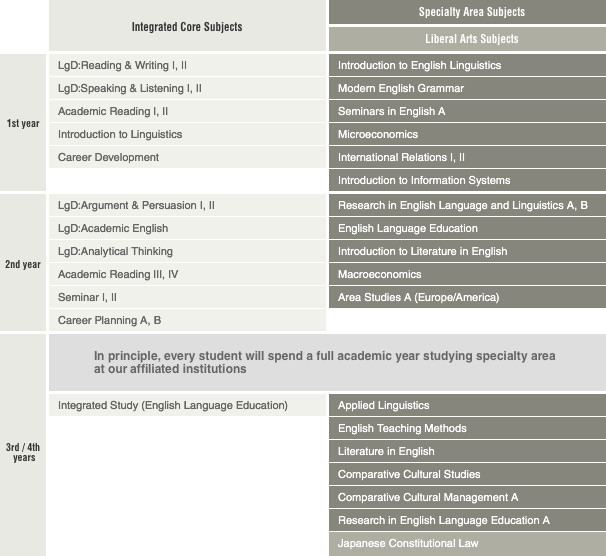 In order to help students maintain their English abilities even after they return to Japan, all-English courses are made available to fourth year students. Career-related classes are provided to students to provide them with the tools needed to enter the workforce and begin their professional careers. The classes guide students not only in discovering careers that they are interested in, but also in designing well thought out plans towards their career. Career Design classes for first year students serve as catalysts with which students can become active in exploring and finding careers that interest them. By second year, students should have discovered what they would like to pursue, and based on student interest, professionals from popular fields and industries will be invited to the university to provide information and also guidance to interested students. Through career-related classes, students will become capable of designing a future that allows them to fully utilize their individuality and also their English skills. All classes are provided by semester, and start and end in either the spring semester or the fall semester. The duration of classes is 90 minutes, and in general, classes worth four credits consist of 90 minute classes that run twice a week. It should be noted that there are Specialized Integrated Classes that consist of two 90 minute classes per week that are worth two credits. A total of 124 credits are required for graduation. 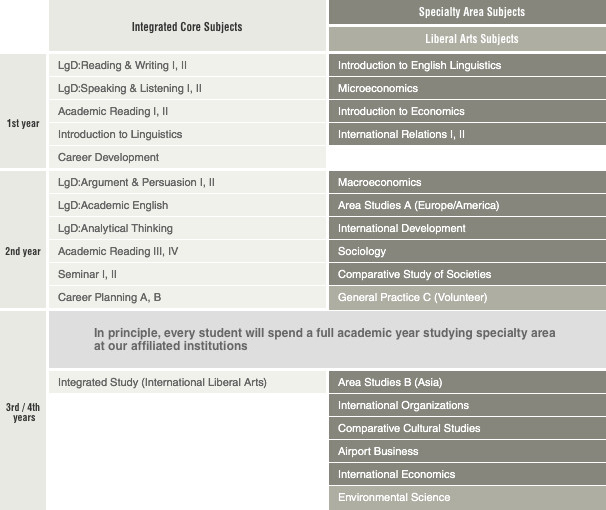 Within the 124 credits, students should have 42 credits from Specialized Integrated Classes, 74 credits from Specialized Research Classes, and 8 credits from International General and Liberal Arts Classes. Credits earned while studying abroad can also be applied towards graduation. In principle, students are required to study abroad for one year during their third year in this school. 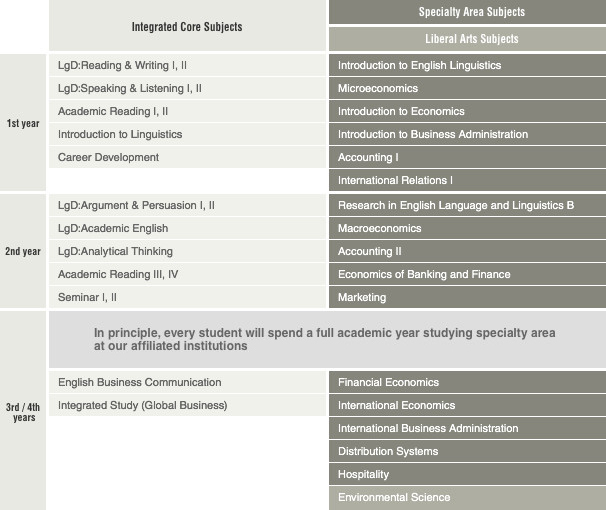 Although many universities provide their study abroad programs to second year students, because the school aims to encourage students to study not only the English language itself, but also to learn about specific fields in English, study abroad programs are provided in third year after students have had sufficient preparation and training in English. A merit that comes with studying abroad in third year is that students are able to improve their skills and gain experience just before they start looking for employment in fourth year. Students who are qualified in terms of academics and English ability are permitted to study abroad in second year as well; as long as a student studies abroad for one of their four years in this department, they will be able to graduate. Students will enroll in classes that are relevant to the field that they have chosen in their first and second years when they are studying abroad. Because studying abroad is an important part in preparing students for their future careers, it is necessary to have strong language proficiency and field specific knowledge beforehand. The curriculum designed and provided at our affiliated institutions allow for a wide range of study and development. For example, those who are interested in becoming English teachers are encouraged to study in Northern Europe where educational studies are highly advanced, and also take advantage of opportunities to participate in teaching practice programs that are offered in Australian universities. Students who are interested in business may go to European business schools and learn together with students that are already in the field of business. Those interested in international relations and international issues can study in Africa to not only learn about but also experience the issues firsthand. We believe that it is important for students to not only study but also gain experience in the field of their choice, and that what they do abroad will play a significant role in their personal maturation and development. In order to provide programs that are specific to the academic levels and needs of all students, a Study Abroad Certification Exam is implemented in order to determine the language abilities and field specific skills and knowledge that students possess. In the exam, class grades, TOEFL (R) scores, grades from written examinations, and also performance in interviews are examined for each student candidate, and those who are determined to be qualified are permitted to participate in a study abroad program. Students participating in exchange programs are only required to pay their tuition fee at Kansai Gaidai University when they study abroad. They do not have to pay tuition for the university they are studying at, and receive scholarships that cover their living and food expenses. Although the amount of financial support differs for each university, students who study at a university in the United States of America receive a scholarship of approximately 1,200,000 Japanese Yen, and are exempt from paying up to 5,000,000 Japanese Yen in living expenses and other costs while they are abroad. Students studying in other countries can expect similar support that fits their needs in their country and university. The implementation of study abroad programs for students in their third year allows them to improve their language and field specific abilities, and return to Japan by the end of autumn semester of their third year to start looking for work. Because the timeline allows students to begin the process of job hunting at the same time as other university students, they do not have to worry about losing out to their competition. Instructors who are currently active in the university serve as academic advisors to students throughout their academic career at the university. Not only do they provide advice and information about classes that are most suitable for the field that students are interested in, academic advisors also teach students effective ways of learning and studying, provide counseling and support in times of difficulty, and guide students in making the most out of their academic career. Staff members of the Center for International Education serve as study abroad advisors, and provide support based on their personal international experiences, as well as the interests of individual students in terms of learning and career formation. Advising is provided in a one-to-one format, and complete support is offered to ensure that every student can successfully complete their study abroad program. Certified staff members of the Career Center serve as career advisors, and work to support students in achieving their dreams and goals for the future. As professional advisors who have broad networks and connections with actual companies and organizations, the career advisors are able to provide field specific information that is extremely beneficial for students when they begin job hunting and pursuing the career of their choice. In order to encourage students to discover their interests and find a career they wish to pursue, first year students are required to enroll in Career Design Classes. In second year, professionals from popular fields that students are interested in are invited to the university as speakers, and offer information sessions to students to increase their knowledge in different fields and career paths. An internship program is one that allows students to work temporarily for companies, organizations, and institutions. Students are able to participate in internships with airline companies, travel agencies, hotels, and other businesses within Japan, and also with various companies and organizations overseas. It is possible for students to incorporate an internship program into their study abroad program in their third year, and the combination of studying and working abroad becomes a great advantage that allows students to rise above their competition. Studying English and also social sciences opens up a wide variety of options for students after graduation. The school provides education that prepares students for working and contributing to fields and industries such as hospitality, service, business, manufacturing, non-profit organizations, as well as many others. By allowing students to develop strong English communication skills, negotiation skills, as well as other field specific skills, this school plays a role in positively contributing to the world by assisting students in becoming capable and strong professionals. English teacher with high levels of English proficiency and practical English teaching skills. * To obtain a first class certificate for junior/senior high school teachers in English, students must earn the prescribed number of credits in the teaching training courses, in addition to the credit requirement for graduation. The goal is to become a capable individual who has a strong understanding of trends and patterns throughout the world.